PROJECT SUMMARY: A beautiful red brick home and picturesque backyard. All the makings of an exquisite landscape lighting design could be found in this New Irving Park home in the Provincetown Neighbhorhood. This home and property was easy to make look good. This system started as a landscape lighting repair project for Southern Lights and after an evaluation of the system and the age of fixtures and use of connections we were able to utilize a few fixtures, it was determined that the majority of the system should be replaced. LANDSCAPE LIGHTING FOCUS: Architectural and landscape lighting on this home were the main focus. Wrapping light around this brick home’s front, side, and rear facades instantly gave a sense of security and a warm and welcoming entrance. The front of the home comprised of a nice brick paver walkway and two Crape Myrtles flanking the front entrance. The moment you pull up to the house, you immediately feel at home. Once at the front door, you’ll find a stone walkway wind around the landscape to the side of of the home. Pathway lighting was needed to help guide the homeowner’s and their guests from one entrance to another safely. Several Dogwood trees were also brought to life with landscape lighting. Moving to the backyard… You are immediately met with pathway lights illuminating the brick paver walkway leading to the back patio and deck. 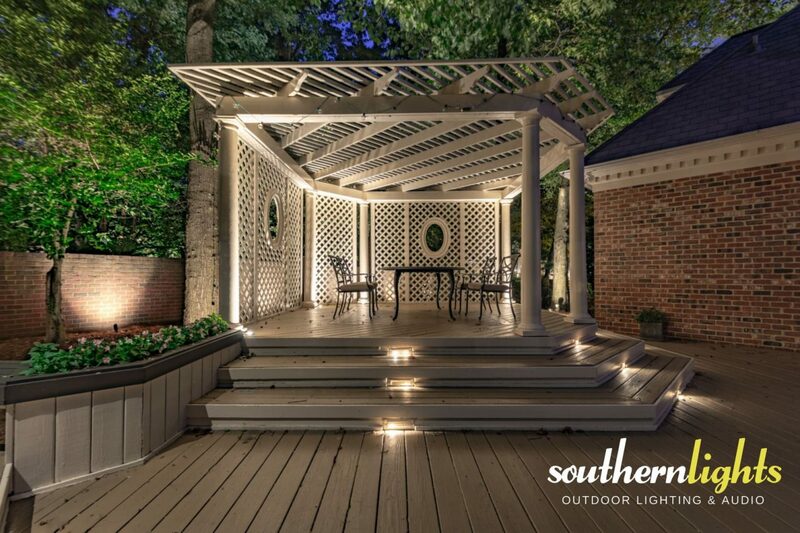 The deck and pergola lighting instantly pull your eyes to the back of the property. LANDSCAPE LIGHTING FIXTURES: 100% made in the USA Clarolux Landscape Lighting Fixtures. Clarolux AL1 “Barletta” Area & Copper Path Light, Clarolux WL3 “Belmont” PAR36 Well Lights, Clarolux TL24 “Venice-II Tree Light, Clarolux WL16-FT-III “Starmount” MR16 Well Light, and Clarolux BL21 “Tivoli” Compact Directional Spot Lights. LOCATION: The lighting designs and installation for this project can be found New Irving Park’s Provincetown Neighborhood, Greensboro, NC 27408. The main outdoor living space centered around the deck creating a beautiful backdrop that can be viewed from anywhere in the backyard as well as through the windows of the home. Around the deck and stone patio, several down lights were utilized to create a “moonlight” effect.